Onigiri to the Japanese is what peanut butter sandwich is to Americans: a classic snack that satisfies all ages from schoolchildren to working adults. (It’s also a popular snack in Korea.) 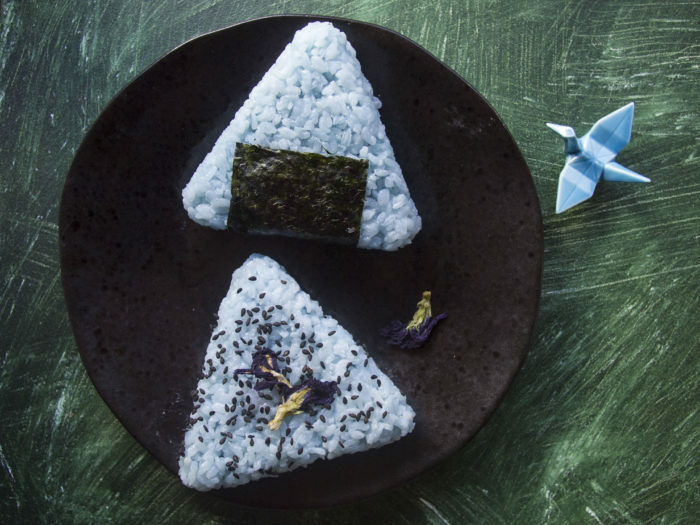 A typical onigiri is rice pressed into a triangle shape that is stuffed with a savory filling and wrapped in nori. Store-bought onirigi contain mostly non-vegan fillings such as tuna and bulgogi. At home you can put in stir-fried vegetables, tofu, or even vegan sausage. The variety of fillings will accommodate everyone’s palate, making onigiri a versatile treat. Though considered a snack in Japan and Korea, it can easily constitute a filling meal. Because onigiri makes rice portable, it makes for an ideal choice to pack for picnics and day trips like hiking. The secret to the perfect triangle shape is using a triangular rice mold, which you can purchase from Amazon. You could also mold it into shape by hand. This recipe puts a spin on traditional onirigi by using butterfly pea flowers that results in a beautiful blue-hued rice stuffed with a chickpea curry filling. You can purchase the dried flowers or powder form on Amazon. The flowers are purely for aesthetic, so feel free to eliminate them. As long as the filling is on point, you’re good to go! Get ready to wow your friends, family, colleagues–and yourself! 1. Boil flowers in water. Then drain flowers. 3. After rice is cooked, let it cool. 4. Add rice vinegar and salt. Turn rice over with a big spoon to mix thoroughly. Set aside and work on the curry. 5. Add some water to the pan, and set stove to medium heat. Add red bell pepper, chickpeas, coconut milk, curry powder, and cayenne pepper. Stir until filling thickens and the red pepper softens. 6. Take your triangle mold and fill one half of the mold with rice, leaving space in the center for the filling. 7. Add curry filling and press down into rice. 8. Fill the second half of the mold. 9. Close mold to seal the shape. 10. Using wet hands take out the triangle-shaped rice. You can use a nori strip to wrap the bottom of the rice or you can sprinkle sesame seeds. Vivian has lived in Japan and Korea and currently lives in NYC. After 13 years of vegetarianism, she switched to veganism in 2012. Her passions lie in fitness and movement, ethical fashion, and environmental-sustainable-minimal living. She is committed to sharing the benefits and joys of a vegan lifestyle. You can follow her on Instagram @iamvivayoung.